Bird Ownership Is Not an Idea. Being Responsible Requires Your Commitment! Impulse buying - Don't do it! You see a beautiful bird in a pet store, at a bird mart or expo and feel that you MUST HAVE IT. Please remember, it is not that simple. 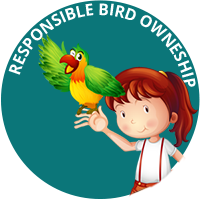 Bird ownership should be (is) a major commitment in time as well as expense. You are now responsible for this cute little baby or adult bird for the rest of its life. Some birds can live for more than 50 years. Just like planning to have a family, you should take several things into consideration before purchasing/adopting this bird. What kind (species) of bird is it? How loud will it get? What size cage and stand does it require? Is there room in your home for it? What is the bird's personality like? How much attention will it demand? Will my schedule allow enough time for this? What does it eat? Do I have time to prepare the bird's food every day? Birds need fresh food and water every day. Fruit and veggies also! Perches - Birds can get their feet infected if they are standing on dirty perches. Cage Bottoms - Birds will pick up and eat old food left on the bottom of the cage. Water Bowls - These will need to be cleaned and disinfected on a regular basis to eliminate bacteria. Toys - Check toys often. Look for broken or frayed parts, rust and exposed metal. Any string or fraying should be trimmed to prevent the bird's nails from being caught. Watch for sharp or rusty wire and chain. Keep quick links closed. Remove clappers from small bells to avoid ingestion Birds need to be groomed on a regular basis. Wings should be clipped and toenails trimmed. If you have a domestically-raised bird, with clipped wings, keep in mind that he/she will most likely not know how to fend for itself if, by accident, it escapes through an open window or door. Not all birds talk, even with species of birds that are considered to be good talkers. They will say words if they choose to, but not necessarily on cue or demand. Be patient and kind and do NOT teach them 4-letter words! That is not cute! Birds are naturally messy, as in the wild, so do not expect them to be neat! Companion birds should be seen by an avian veterinarian or avian specialist for regular well-bird checkups, or if they show any signs of illness. Please keep in mind that birds are very clever at masking their illness. If you find your bird on the bottom of its cage, puffed up and not acting like normal, you should contact your avian veterinarian or specialist as soon as possible. Don't delay! 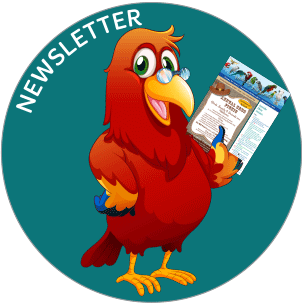 You can find a list of Southern California avian veterinarians or avian specialists elsewhere on our website, several of which are SBBS sponsors. Consider having your bird microchipped to assist in identifying your bird if he/she is lost or stolen. A pet bird is a companion, not an ornament. It is loving, feels emotion as well as pain and is very sensitive and responsive to your actions and affection. In turn, you must respond to its needs as your dependent and, by doing so, you may well have a friend for life!